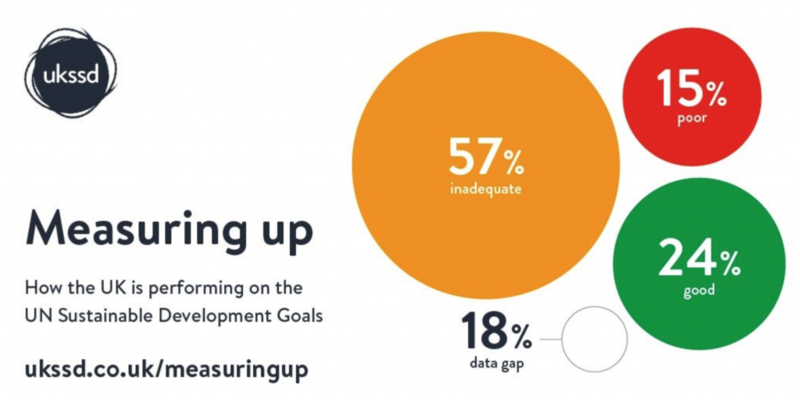 Measuring up is an inflexion point in the UK’s approach to the UN’s Sustainable Development Goals. For the first time we have a clear picture of the progress that has been achieved and what remains to be done if we are to meet the Goals by 2030. This report represents a unique collaborative effort, involving more than 100 organisations from across the UK. We assessed quantitative data from public sources such as the ONS and the policy context in the UK. We asked if there is policy or legislation in place that is good enough to achieve the target. The research for each SDG chapter has been led by an organisation with expertise in that area. Following their initial research, stakeholders reviewed and contributed to their expertise. This was captured and incorporated in the summary presented in the report. How is the UK measuring up? The result is the most comprehensive report in the SDGs in the UK. It reveals that while there is much to celebrate, the most vulnerable people and places in our society are increasingly being left behind. The UK is performing well on 24% (green) of 143 relevant targets, with 57% where there were gaps in policy coverage or performance is not adequate (amber) and 15% where there is little to no policy in place that adequately addresses the target or the performance is poor (red). The best performance is in Goal 3 Good Health & Wellbeing, Goal 4 Quality Education and Goal 17 Partnerships to achieve the Goals, where there is a higher quantity of ‘good’ targets. The worst performance is in Goal 15, Life on land, where four targets are ranked poor. Goals 2, 5, 9 and 13 on Zero Hunger, Gender Equality, Industry, Innovation and Infrastructure, and Climate Action have no targets with a ‘good’ performance rating. There are data gaps on 18% of the targets. Our analysis has focused specifically on the performance of the UK and not compared it other nations because we want to know what the UK needs to do to achieve the Goals domestically. From a procedural point of view the UK is behind many other nations, of 193 UN member states more than 100 would have reported to the UN by the time we do so. Many of those have national SDG strategies and the governments are working with stakeholders in their countries to achieve the Goals. Similar European nations like Finland and Germany they have systems in place within their governments to have a joined-up plan for the SDGs, with mechanisms for government to work with stakeholders. We could also learn lessons from countries like Colombia, who are using the SDGs as part of the peace-building process. The UK could do similar as part of developing a vision if a future UK following our withdrawal from the EU. Given that so many individuals and organisations are passionate about the SDGs it is not surprising that there is impatience with the limited progress the UK has made so far. However, we have to know the state of play so we can make the right sort of interventions and respond to the systemic nature of the challenges reflected in the Goals. This is what Measuring up helps us to do. Government needs to place responsibility and ownership for the SDGs within the Cabinet Office and either a minister who has a domestic policy role or the Prime Minister to take responsibility. Government must work with multi-stakeholder forums including UKSSD to develop the Voluntary National Review for the SDGs and related policymaking. Businesses have a critical role to play and some UK businesses have already responded to the SDG agenda in a positive way, recognising the economic opportunities as well as the social and environmental need for action. Charities should consider how their individual goals sit within the broader SDG agenda and where they might be able to amplify results by working with partners across different targets. Together, the 17 Goals and 169 Targets of the SDGs are the best chance we have to end poverty, reduce inequalities, halt biodiversity loss and combat climate change. These challenges threaten our society and are the biggest risk to a secure and stable future. The Goals provide us with a blueprint for a future where we have overcome them. They are also universal, and every nation needs to develop its own plans to implement and achieve them by 2030. Countries with high levels of poverty and disadvantage should receive the most help to do so, but they’re still an opportunity for all of us. The SDGs give us a chance to make the UK a country that works for everyone, where people and places are not left behind.